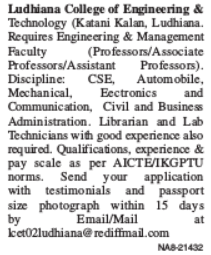 Ludhiana College of Engineering and Technology, Katani Kalan has advertised in the TRIBUNE newspaper for the recruitment of Professor / Associate Professor / Assistant Professor Plus Non-Faculty jobs vacancies. Interested and eligible job aspirants are requested to apply within 15 days from 04th July 2018. Check out further more details below. About College : LCET campus is situated on Ludhiana-Chandigarh highway (NH-95), Katani Kalan near Neelon Bridge. The institute has excellent an access by city buses plying direct to the campus. Decent and affordable on-campus separate hostel acomodation is available for boys as well as girls. The college building consists of well equipped classrooms, library, laoratories, workshops, common rooms, gymnasium, auditorium and cafeteria. A number of diverse food and entertainment outlets are alao available near the institute. How to Apply: Interested and eligible candidates are requested to send their CV, copies of certificates and recent colour PP size photo at the following email address.